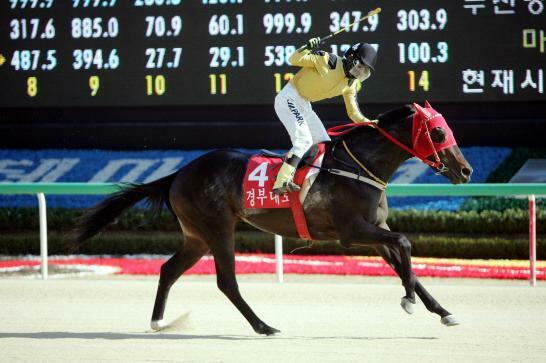 Busan hosts its first Stakes race of 2014 this Sunday when nine horses go to post for the mile-long Busan Ilbo Cup. Has had a hard time since graduating to class 1 after an impressive summer last year. In his favour is that he will carry by far the lightest weight in the race. Another who has struggled for form of late although ran a creditable 5th in the President’s Cup at Seoul last November. Plenty of talent but is trainer Kim Young Kwan’s 2nd string here. Top weight reflects that he is a top horse whose win record doesn’t reflect his ability. Won the KRA Cup Mile over this distance almost 2 years ago and even with the weight, will be a contender. Finished behind Grand Teukgeup in his last two outings and will have to work some to overcome that form here. Only out of the money 3 times in his 21 starts so always goes close. The only filly or mare in the race, she was 3rd in the Korean Oaks in 2012 and 2nd in the Ttukseom Cup last year. Won last time out at 7 furlongs and must be considered. Kim Young Kwan’s first string, he’s won his only start at this distance although that was at class 2. Skipped the Classics last year and regarded as one to follow this season. Has won his last two starts, both at this distance. He steps up in class here but has the speed to make a strong challenge. Peter Wolsley’s runner hasn’t been seen since a disappointing run in the President’s Cup in November but he’ll most likely appreciate the drop back in trip and could be in with a shout of a place. Reliable campaigner who has been competing at class 1 for two years now. Likes the distance and has wins over a number of his rivals here. Will need to be at his very best to challenge though. Busan Race Park: 6 races from 12:45 to 17:00 including the Busan Ilbo Cup at 16:10.